Marcus Gronholm was the only man who could keep Sebastien Loeb in sight in recent World Rally Championship seasons, and even the Finnish great couldn't prevent him notching up four successive titles. So with Gronholm retiring at the end of 2007, it looked like Loeb's dominance would reach new heights in 2008 - and sure enough the incredible Citroen driver became the first five-time WRC champion in history, while also breaking his own record by winning 11 of the season's 15 rallies, including his first triumphs in the celebrated Finland and Great Britain events. But it would be wrong to say that Loeb had no competition, that he had an easy run to the title, or that his superiority and the loss of the works Subaru and Suzuki teams means that the WRC is in an irrevocable decline. 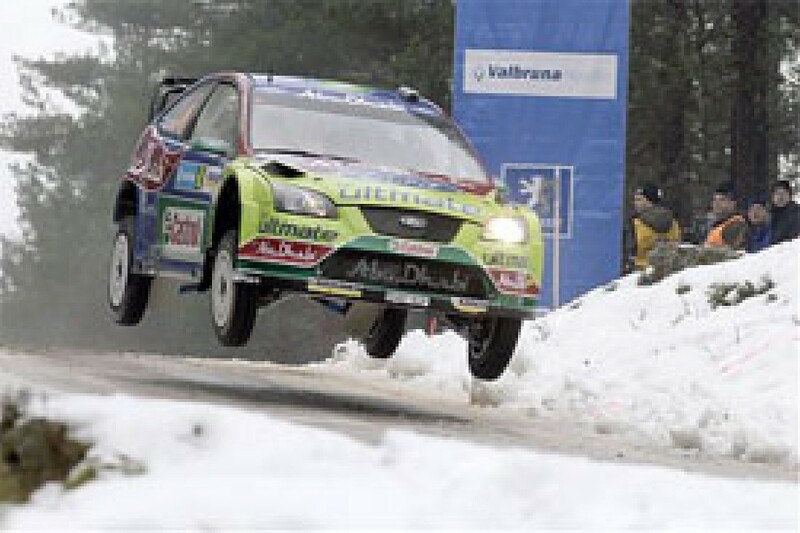 It took until the penultimate round of the season for Loeb to wrap up the 2008 title, as Mikko Hirvonen raised his game in his new position as Ford's team leader. For Loeb to lose this championship would have been a staggering upset and few imagined it would happen, but Hirvonen kept him on his toes and made this a more exciting contest than the sceptics had predicted. Predictably, Loeb ran away with the Monte Carlo season-opener, taking a record fifth win in the event. But then things went off-script in Sweden, where the Frenchman crashed out of third place. That left him six points behind Hirvonen in the standings, thanks to the Ford driver's pair of second places in the early rounds. Hirvonen's championship position was deceptive though, for he was far from a victory factor in either Monte Carlo or Sweden, and was being thoroughly upstaged by new teammate Jari-Matti Latvala. The 22-year-old graduate from the satellite Stobart squad recovered from an awful, error-strewn start to his life as a works Ford driver in Monte Caro by dominating the Swedish event, and becoming the WRC's youngest ever rally winner in the process. It was an amazing achievement, and prompted his illustrious predecessor Gronholm to suggest that Ford should stop regarding 2008 as a learning year for Latvala and back him for a title challenge - a call that gained further weight when the young Finn led again in Mexico before turbo problems dropped him back to third. Delayed by a string of punctures, Hirvonen was only fourth in Mexico - just enough to keep him ahead of eventual winner Loeb in the points, but he remained perturbed by his failure to match either his teammate or his title rival for pace. However Hirvonen's season then turned around as he dominated the early running in Argentina. Broken suspension cost him a likely victory (which went to Loeb, while Latvala crashed), but he finally got his first win of the year in Jordan later that month. The inaugural Middle Eastern event was a controversial thriller. After several years in which cars ran in reverse order on days two and three (so the leaders had the cleanest stage conditions), from 2008 drivers took to the stages in their rally positions - and consequently on the many really dusty rallies a Friday or Saturday lead was almost certain to be eroded or overturned. This meant that many 2008 events had much more exciting finishes than would otherwise have been the case - and few complained about that. But it also encouraged teams to deliberately slow to avoid running first on the road, a tactic that Ford first employed on Saturday in Jordan, dropping both Hirvonen and Latvala back behind Loeb's teammate Dani Sordo. That left Sordo thoroughly compromised on day three, and although he only fell to second as Latvala suffered suspension damage, he could do nothing to stop Hirvonen snatching the win. Citroen were unimpressed by this, and absolutely apoplectic when Ford used the tactic even more dramatically to secure a one-two in Turkey two rounds later - even briefly threatening to quit the championship in protest. Hirvonen's Turkish win put him three points ahead of Loeb going into the mid-season break, a situation few would have expected. In addition to his Swedish DNF, Loeb had failed to score in Jordan after a bizarre head-on collision with Citroen junior driver Conrad Rautenbach on an access road between stages, an incident made all the more galling by the fact that Loeb had taken the rally lead shortly beforehand and was pulling away. He then masterfully fended off the closing Fords when running first on the road in Sardinia, and won again amid extremely high attrition in the Acropolis Rally, but Hirvonen's third place here (despite an array of problems) kept him close enough to edge back ahead after Turkey. With the forthcoming Rally Finland predicted to be a Ford stronghold, the championship fight briefly looked wide open, only for Hirvonen's fortunes to decline just as Loeb stepped up a gear. Contrary to expectation, Loeb beat the Fords in Finland, edging away from the disbelieving Hirvonen to take one of his finest ever victories. Much more predictable was Loeb's subsequent win in Germany, where he has never been beaten, but even more important for him was the puncture that dropped Hirvonen back to fourth in the rally and second in the points. Ford should have struck back in New Zealand, where Citroen reluctantly and apologetically used the slowing tactics to give Loeb a better position for day three, only to find that he couldn't close on Hirvonen and Latvala even with a cleaner road, and to then spin while pushing to catch up. Remarkably though, the champion still emerged victorious, as in the penultimate stage a puncture for Hirvonen and an error by Latvala ruined Ford's rally (Stobart driver Francois Duval crashed out of fourth at the same time, just to add insult to injury). New Zealand was Ford's last chance to stay in control of the title race, for Loeb subsequently took his expected brace of asphalt wins in Catalunya and Corsica. The only comfort for Hirvonen was that he at least salvaged second in France after Sordo crashed out - a rare error in a promising season for the Spaniard, who delivered some very impressive podiums. It's not easy to make a name for yourself when paired with a legend of the sport, though, and Sordo still needs to take another step up. Loeb was duly able to clinch the title with a conservative third place behind Hirvonen and Latvala in Japan, and he then finished the year in fine style by beating Latvala to Rally GB victory in the final stage after a thrilling two-day battle. That Loeb still had that much stomach for a fight in Wales' unpleasant icy conditions even after securing a record fifth straight title says all you need to know about the incredible Frenchman. It would be a travesty if his 2008 championship is undervalued in the future because he faced relatively little opposition. The combination of the revised road position rules, some misfortune and Hirvonen's tenacity presented plenty of challenges to overcome, and he did so with a vengeance. The WRC has been rocked by prolonged uncertainty over its future technical and promotional direction, and in recent weeks by the global economic downturn.